My final picture from the Glasgow Science Centre is of an exhibit which demonstrates something to do with the attraction of positive and negative ions (see, I told you I wasn’t a scientist – that’s about as technical as I can get!). This picture shows the inside of a large crystal ball, and if you just stand and look at it this is what you see. 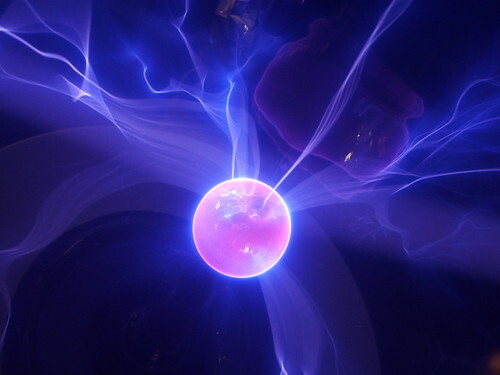 If however you put your hand on the ball all of the random waves you can see emanating out from the nucleus are attracted to your hand in a single wave that looks a bit like lightning – it’s something to do with an attraction of positive and negative charges, but beyond that you’d have to ask the proper scientists! Anyway, I think this is the photo I took at the Science Centre that I was most pleased with. This entry was posted on February 17, 2008 at 12:01 am	and is filed under Uncategorized. You can follow any responses to this entry through the RSS 2.0 feed. Both comments and pings are currently closed. the photo is stunning. was it hard to get that photo for that result? Yes, very beautiful photo, it seems a painting of the universe. I too like it a lot. Those shades of blue are very cool. Thank you everyone. Alaya, it was actually stupidly easy. I rested the lens against the crystal ball, and took it without flash. That was all! I didn’t know what to expect but was really pleased with how it ended up. Maria, I love your description “a painting of the universe” – what a lovely way of putting it!